A good validation program can differentiate your company from others in the industry. Successful validation practices verify that systems operate as designed, ensure that manufactured products are of the highest quality and safety, and minimize 483 findings. To meet U.S. and international regulatory requirements, your validations have to be top-notch. Whether you are developing a new process or validating legacy equipment, Deaton Engineering can help. 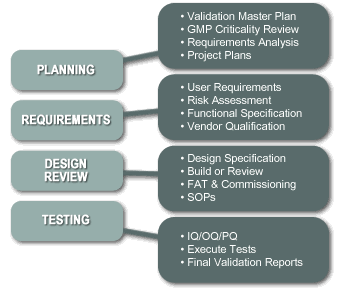 We understand current GMP requirements and follow the proven Total Quality Approach to providing engineering services. Our risk-based approach to pharmaceutical engineering is successful with even the most complex validation projects because we take the time to fully understand the process, system, or equipment and all of the systems that affect it. Our documentation packages have a proven history of satisfying FDA auditors. the situation if you receive one. Deaton Engineering can audit your facility’s validation program, perform gap assessments, and identify the most critical systems to be addressed. We then develop a validation master plan that describes a compliance strategy, long-term schedule, personnel responsibilities, and methods to accomplish compliance goals. Deaton Engineering develops installation, operation, and performance qualification protocols for all types of pharmaceutical processes, equipment, and facilities. Our validation documents thoroughly verify that the system was installed correctly and that the functionality, alarms, limits, error-handling capabilities, throughput, and other functions operate as intended. Deaton Engineering employs a proven risk-based approach to electronic records based upon sound logic. We define the criticality of each record, examine the entire life of a record from origin to archive, analyze functionality, define and verify security requirements, and make sure the systems provide an electronic audit trail.